In your accountant's end of year questionnaire, you will need to provide closing livestock tallies for the financial year. If you are correctly recording livestock sale & purchase transactions and births, deaths & missing throughout the year, then most of the work has already been done. Choose Transactions (Actual Cashflow) for the financial year you are balancing. Change the view to Annual Views. If the year end stock numbers are correct, then congratulations! Your livestock reconciliation is complete. If they're not, use the checklist below to guide you through balancing your stock rec. Are year end tallies correct? If not, continue on to step 2. 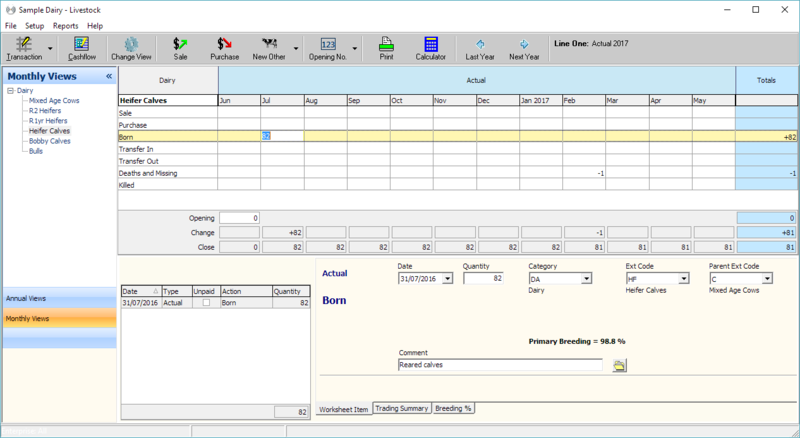 Create a worksheet by right clicking your mouse on the month and selecting New Born. A worksheet allows you to add details like notes to the event. Repeat for other stock codes i.e. bobby calves, lambs etc. Are year end tallies correct? If not, continue on to step 3. Are year end tallies correct? If not, continue on to step 4. The quantity has been recorded against each sale/purchase, with the exception of bonus payments. The sale/purchase date is correct, especially if you're buying/selling stock around the end of the financial year. The correct stock code has been allocated to the transaction. For example, should the transaction be allocated to a sale lamb or hogget? Are year end tallies correct? If not, it might be time to have a chat with one of the team on our Helpdesk.